Jacob Okonski was born in the 1780 – 1783 in Slabomierz , Prussia - Poland . Jacob’s dad, Jacob Okonski, was born about 1750 in Prussia-Poland and was married to Eva Boianska. 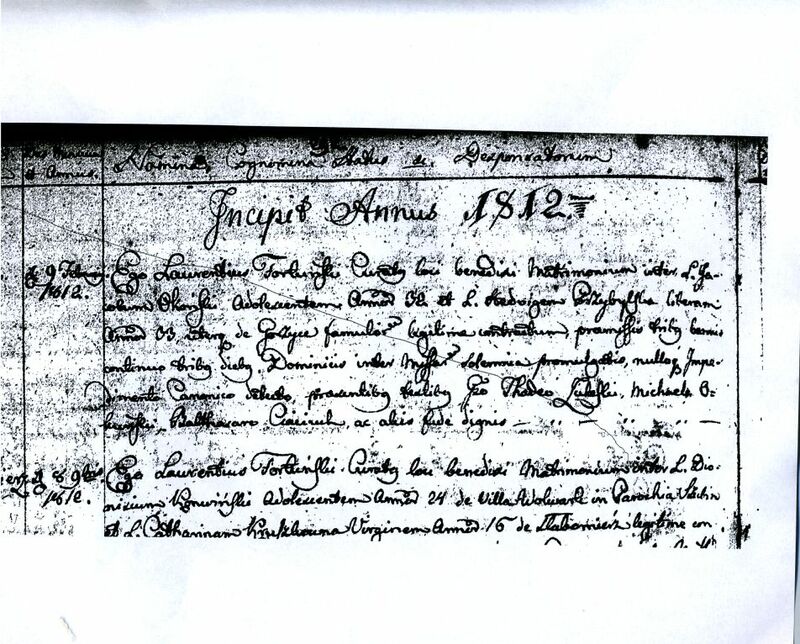 Jacob Okonski married Hedwig Przbylski in February 9, 1812 in Gorzyce , Prussia - Poland . Hedwig was born 1779. Hedwig died August 12, 1822. Jacob Okonski remarried to Marianna Majchczak on January 27, 1823 in Gorzyce , Prussia - Poland . Marianna was born June 8, 1806 in Dochanowo , Prussia - Poland . Marianna was the daughter of Adalbert Majchczak and Regina Majchczak. Jacob’s 1st child was Valentine Okonski born February 7, 1816 in Gorzyce , Prussia - Poland . He married Apolonia Brzyka on September 8, 1849 in Gorzyce , Prussia - Poland . Apolonia was daughter of Valentinus Malak and Marianna Dutkowa. The second child was Rosali Okonski born September 3, 1828 in Slabomierz , Prussia - Poland . She married Joseph Michalski on May 29, 1849 in Gorzyce , Prussia - Poland . Joseph was son of Michael Michalski and Marianna Szlotoski. The third child was Wawrzeniec Okonski born July 24, 1824 in Slabomierz , Prussia - Poland . The fourth child was Anna Okonski born Julay 29, 1826 in Slabomierz , Prussia - Poland . She married Andreas Felcyn on February 9, 1846 in Gorzyce , Prussia - Poland . Andreas was son of Thomas Felcyn and Marianna Kujawa Felcyn. The fifth child was Joseph Okonski born February 18, 1833 in Slabomierz , Prussia - Poland . He died February 22, 1834 in Slabomierz , Prussia - Poland . The sixth child was Paul Okonski born December 27, 1834 in Slabomiercz , Prussia - Poland . The seventh child was Michael Okonski born February 3, 1837 in Slabomiercz , Prussia - Poland . The eight child was Adalbert Okonski born April 23, 1839 in Slabomierz , Prussia - Poland . He married Agnes Felcyn on October 20, 1861 in Gorzyce , Prussia - Poland . Agnes was daughter of AntoniusFelcyn and Katarina Bryk – Felcyn. The ninth child was Simon Okonski born in October 9, 1841 in Slobmierz , Prussia - Poland . The tenth child was Macij (Mathias) Okonski born February 23, 1844 in Slabomierz , Prussia - Poland . He married Marianna Nyka on May 25, 1869 in Znin , Prussia - Poland . Marianna was born January 29, 1850 in Skarbience , Prussia - Poland . She was daughter of Joseph Nyka and Barbara Cieslak. Marianna, Macij and their firs son Joseph at age 20 months took the vessel Cambria and landed in New York on October 4, 1873. Marianna died October 15, 1892 and is buried in St Mary’s Cemetary in Bremond , Texas . Macij married a Michalina (Annie) Jerzek Foyut on January 25, 1893 in Bremond Texas . She was born in October 1850. Macij died September 3, 1916 and is buried in St Mary’s Cemetary in Bremond, Texas. For additional information and continuing generations, read Joseph and Victoria Szturemski Okonski, son of Macij, and Edward and Helen Nowak Okonski, son of Joseph and Victoria in the Family Stories section.